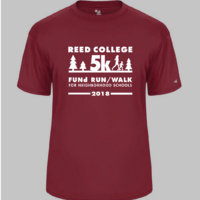 Join us on Saturday, September 22, 2018, for the Reed College 5K FUNd Run/Walk to support southeast Portland’s public elementary schools. One-hundred percent of the registration fees and sponsorship dollars go directly to Duniway, Grout, Lewis, Llewellyn, and Woodstock elementary schools. Last year, participants and contributors raised more than $35,500 helping more than 2,000 children. With your support, we hope to match last year’s success.